Jared Spool did the opening keynote presentation early this morning at IA Summit 2008. His talk, titled Journey to the Center of Design, was funny enough to keep us awake and provocative enough to keep us listening. He went on to talk about the mild feud that’s brewing between the boys at 37signals and Don Norman. I had linked to these sites last month, when Norman asked the question, “Why is 37signals so arrogant?” in response to an article in Wired Magazine in which the guys made no apologies when they said that they don’t design their products for their users, but rather design for themselves. They defended themselves, of course. Process is the steps necessary to get something done. 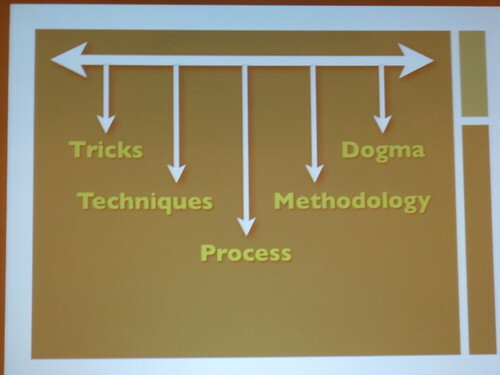 The research at UIE has found that the best teams don’t have a steadfast methodology or dogma that they follow. Instead the best teams focused on increasing the number of techniques and tricks in their toolbox, constantly exploring new possibilities. To illustrate his point, Jared conducted an impromptu “brand engagement study” with a selection of audience members. Before his talk started, he asked 30 people (me included) if they would be willing to fill out a survey and participate. We were asked 11 questions about our feelings towards four brands: Starbucks, McDonalds, Apple and Microsoft. We had to rate each statement on “Don’t Agree,” “Neither” or “Agree.” Then for each brand we tallied up all of the columns and subtracted the sum of “Don’t Agrees” from the sum of “Agrees,” equaling a number between -11 and 11 that represented our affinity toward the brand. When he called us to the front of the room during his talk, we were told to stand by our number pasted on the wall as he called out each of the brands. In essence, we created a human bar chart. No one was surprised to see that the curve for Apple was skewed positively while Microsoft was skewed negatively. The elaborate display was meant to demonstrate that information about customers can be gleaned in limitless and unique ways (new techniques) that are in service to the ultimate goal. Thanks to Jared for not being afraid to say what many of us are already thinking, and for giving us a way to articulate it. Great recap. Adds lots of missing context from tweetstream! There has to be an ‘early adopter’ angle to this thinking. I’ve been screaming same for years…and immediate colleagues think I’m insane. But then most of them are still reeling from pride over their CUA Certification. I refused to drink their Kool-Aid. This is so refreshing to see. Part of what wasn’t clicking at my last job was that nobody was realizing the importance of having a vision to rally around. When I tried to develop that vision, the culture worked against me; but when I followed their direction and backed off, suddenly nobody knew what to do. I think those are three valuable points, and I definitely think that is where our field is going. I’ll make sure to keep them in mind. Interestingly, Tom Fishburne has a similar take on Jared’s chart shown above.